My I AM Presence - Who is Saint Patrick? 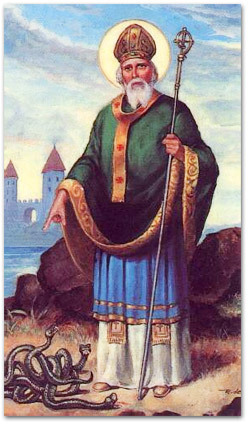 Saint Patrick is the great saint and patron of the Irish people. His intensely spiritual nature, his enthusiasm and his strength in action enabled him to surmount tremendous difficulties and to gradually bring the Christian faith to all Ireland. Patrick was born in Roman Britain in late fourth century A.D.
His father, Calpurnius, was a deacon in the Christian church. When Patrick was sixteen years old, a band of Irish marauders carried him off and kept him in captivity tending herds. After six years, he escaped, and after several years he returned home. Patrick faced many difficulties in his life. He was never afraid to confront evil and he knew that Jesus Christ lived in him and spoke through him.